Hemospray® wins approval to market in the US! We’re excited to announce that we are now able to offer US clinicians and their patients the Hemospray Endoscopic Hemostat—a hemostasis treatment option for critical GI bleeds. This revolutionary treatment modality, which has been making a clinical impact internationally since 2011, has recently been granted marketing authorization by the FDA in the US. 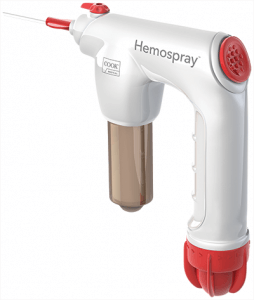 Unlike traditional hemostasis therapies, Hemospray is a non-thermal, non-traumatic, non-contact modality that doesn’t require the precise targeting of other endoscopic devices. When the Hemospray comes in contact with an actively bleeding site, the powder absorbs water, then acts both cohesively and adhesively, forming a mechanical barrier over the bleeding site. To see exactly how Hemospray works, click the video below. In clinical studies, Hemospray has been shown to be an effective endoscopic treatment option for certain GI bleeds. You can read those studies at our dedicated Hemospray website*: hemospray.cookmedical.com. While there, you can also access Hemospray case videos, product specifications, FAQs and other supporting information for you and your patients. You will also learn about upcoming Hemospray Vista Education and Training events in your area. Hemospray is just one more example of our commitment to creating innovative solutions to the complex problems you face every day as you strive to provide the best possible care for your patients. We feel sure that Hemospray represents an important new option for your patients with critical gastrointestinal bleeds. To learn more about making Hemospray a part of your hemostasis toolbox, please do not hesitate to contact your local Cook Medical representative. *The Hemospray website is accessible only to those countries where Hemospray is available.